When you emerge from bed in the morning, do you want to sink your toes into luxurious softness? Then carpeting is for you! Besides its endearing softness, wall-to-wall carpeting provides insulation, sound-absorption, and slip resistance. When choosing carpeting from all of those samples on the showroom floor, hone in on material and style. The ultimate luxury, wool is the most expensive, but it also can’t be beat, thanks to its beauty, durability and softness. This natural, renewable, sustainable, biodegradable material is exceptionally durable. It’s also inherently stain- and crush- resistant, flame retardant and non-allergenic. Nylon mimics wool in its performance and feel, but costs less. It resists dirt and can bounce back from wear, making it appropriate for most rooms. Known for its soft texture and color-fastness, polyester is a good value. While it’s relatively easy to care for, it is not as resilient as some other materials and works best in low-traffic areas. This synthetic material, also referred to as olefin, is water and stain-resistant. It is solution-dyed so will not fade. It is not as tough as nylon, but makes a good choice for indoor/outdoor carpeting. This fiber performs like polyester and nylon, as it’s stain resistant, durable, soft and color-fast. It’s made from a polymer, which comes in part from corn. Manufacturers are responding to consumer demand for sustainability by offering carpeting made of pre- or post-consumer products, which can range from recycled nylon carpeting to recycled soda bottles. Sisal, coir and jute, which are woven from plant fibers, aren’t limited to use in area rugs. Carpets are made of fibers that are cut, looped, or cut and looped. The more texture there is in a carpet, the more resilient it is to footprints, dirt and wear. 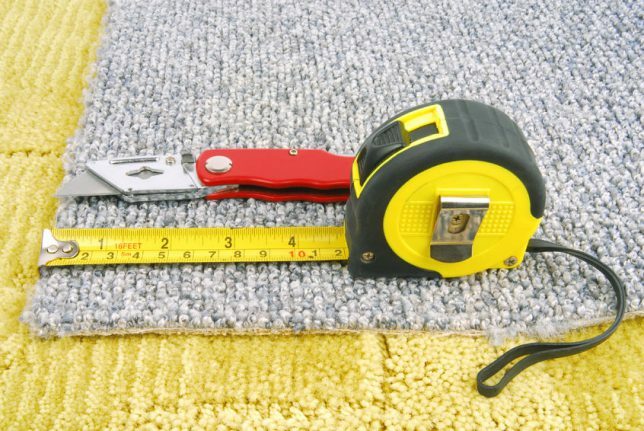 For this style, carpet loop tips are cut to provide a soft, cushiony texture. Short-cut pile, like Saxony and velvet, shows footprints and vacuum trails and works best in bedrooms. Longer-cut pile, such as shag and twisted frieze, hides the traffic marks, but is more difficult to deeply clean by vacuuming. For this style, the loops aren’t cut, so the carpet isn’t as soft, but it tends to wear stronger, making it fine for hallways and living areas. Loops can be of the same level or multi-level. Berber carpets have level loops with multi-colored flecks. Multi-level loops can create a variety of patterns. As the name suggests, cut-and-loop, or cut-loop, is a combination of the other two carpet styles. Because its texture varies, it can help hide dirt and wear, making it a good fit for high-traffic rooms. The pile can be a mix of heights, or of the same height. The nature of cut-and-loop makes it possible to create patterns and sculptured effects on the surface of the carpet. Hire a flooring and carpet installation expert in your local area. For expert floor installation of wall-to-wall carpeting, work with an experienced flooring contractor. All of the contractors in the Contractor Connection network have proven experience and credentials, and their work comes with a three-year warranty on all workmanship. It’s easy to get a free estimate — simply enter your ZIP code above and you’ll be matched to a qualified contractor near you.